For ESL students, reading for several hours is a daunting task that bore most people. When boredom kicks in, efficiency decreases as the time spent on reading increases. It is more effective to study when both visual and auditory senses are at work. Videos provide an interactive and sometimes entertaining way to study smarter. Documentary videos can provide either a general or a specific view of a particular topic. The information that students pick up in a documentary can lead to further learning. If they can use the chapters of a book to the documentary, it will provide motivation to read. Textbook reading no longer gives the impression that it is a task that students should do. Rather, books are resource materials that explain and answer questions. Video tutorials allow students to skip learning points they already understand. They can also replay the parts of the discussion they are having difficulty with. A medical student can pause a video demonstrating a suture. This can help the student see the exact location of a surgery stitch or how drawing a partition is performed. Slow learners and visual learners can catch up with a fast paced class. Virtual learning provides a high-tech medium where teachers and students can interact. There is no need to meet in a physical classroom. This favors ESL students who learn better when they are in a familiar place, like their own bedroom. It also promotes peer discussion where classmates can talk about their homework. Students have liberty to ask and answer questions without fear of being wrong. The use of videos in ESL classrooms is becoming the norm because of the internet. Students can review anywhere and anytime as long as there are available tools that they can use. With this, students can better concentrate and focus when their mind starts to wander when reading through plain text. 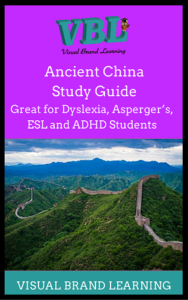 Ancient China: Visual Study Guide is available for a discount for a limited time on Amazon. Check our blog for more articles.